*Note: the dates of issue in the sections marked with an asterisk above are derived from the material in the Davies collection of Libya Revenues ex the Bradbury Wilkinson archive, which is housed in the British Library. Dates and requisition numbers of individual printings are footnoted below each set listing, though print quantities are not known at present since the Davies material does not record them. c1951. Mujahid postage stamps of Cyrenaica with bilingual LIBYA overprint (= SG 140ff) further overprinted Revenue in mixed case (#1/3) or in capitals (#4), in English only. It is possible that these stamps were for use in Cyrenaica only, since Tripolitania and Fezzan did not use millièmes as their currency until 1952. 1954 (earliest known usage). 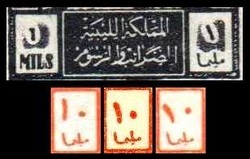 King Idris postage stamps (= SG 186/7) overprinted REVENUE (sideways reading upwards on 200m, upright on 500m) in English and Arabic. Perf 11½. No watermark. 1956 (earliest known usage). As previous issue but with additional value (100m as SG 185) and overprinted FEDERAL REVENUE in Arabic and English. Coat of Arms in large format (27 x 32 mm) with curved inscription United Kingdom of Libya at foot. Perf 11½. No watermark. Printed (recess) by Bradbury Wilkinson. a) 1955-60. Inscribed CONSULAR SERVICE below Arms. b) 1956-62. Inscribed FEDERAL REVENUE below Arms. Note: the three values of the first printing (200m, £L½ and £1) are also known with red Specimen overprint, as shown below. Coat of Arms in smaller format (22 x 26 mm), inscribed United Kingdom of Libya. Perf 13. No watermark. Printed (recess) by Bradbury Wilkinson. a) 1963. Inscribed CONSULAR SERVICE below Arms. All values were produced in a single printing (Req 0/137266) dated 15 Jan 1963. Note: For similar stamps but inscribed KINGDOM OF LIBYA at foot (without UNITED), see #51/53. b) 1963. Inscribed FEDERAL REVENUE below Arms. Both values were produced in a single printing (Req 0/136928) dated 20 Nov 1962, with the stamps being issued probably in early 1963.
c) 1963. Inscribed FEDERAL REVENUE below Arms, and PRIORITY reading upwards at sides. Produced in a single printing (Req 0/137090) dated 28 Jan 1963. Similar small-format Arms types (22 x 26 mm) but inscription at foot changed to Kingdom of Libya. Perf 13. No watermark. Printed (recess) by Bradbury Wilkinson. a) 1964-67. Inscribed CONSULAR SERVICE below Arms. b) 1964-67. Inscribed REVENUE below Arms. c1960s. Tajura Mosque type similar to T91ff of Tripolitania (see Kingdom regional issues), but without REVENUE in English and inscribed Kingdom of Libya Taxes and Fees at foot in Arabic. 24½ x 29½ mm. Perf 11½. No watermark. Figures of value in same colour as rest of design. Printer unknown. Note: Different examples of the same stamp can show variations in the figures of value. Three examples of #64 are enlarged in the image above right, showing the Arabic figure 1 vertical, slanting slightly and diagonal. It is not known whether these represent different printings or whether they are variations within the same sheet. 1964-68. Benghazi Town Hall type similar to C51ff of Cyrenaica (see Kingdom regional issues), but inscribed Kingdom of Libya (top) and Taxes and Fees (bottom), in Arabic only. 27 x 32 mm. Perf 11½. No wmk. Printed (recess) by Bradbury Wilkinson. 1968. Coat of Arms and map of Libya featuring oil wells and other national symbols, 27 x 31½ mm. Inscribed Kingdom of Libya Revenue Department in Arabic and English. Perf 11½. No wmk. Printed (recess) by Bradbury Wilkinson. All values were produced in a single printing (Req F/146275/307) dated 26 Jul 1968. Note: For similar stamps overprinted with Arabic letters, see Libya (Republic and People's Republic) #100a/b. 1950s-60s. Similar to #61/74 but impressed stamps. b) General-purpose stamp paper with impressed stamp measuring 35 x 42 mm, large figures of value. First recorded usage 1963.